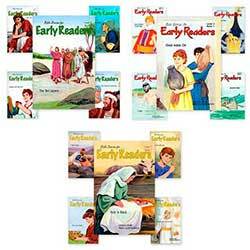 Each reader is a paperback with full-color illustrations. 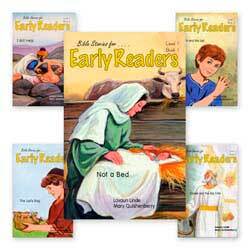 From Alpha Omega publications, these readers can be used with any reading program. 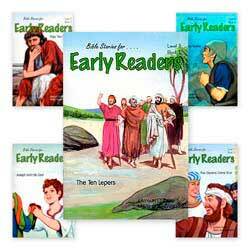 For your convenience, we also offer the Bible Stories for Early Readers Bundle with all three levels. The stories in this level emphasize short vowel words. Each reader is a paperback with about 32 pages with full-color illustrations. Each story has new words at the beginning and comprehension questions at the end. The stories in this level begin with vowel blends and progress through to silent e words. New words are found at the start of each story. Comprehension questions follow each story. Each reader is a sturdy paperback with about 32 pages with full-color illustrations. The stories in Level 3 practice double-vowel words, r-controlled vowels, and consonant blends. 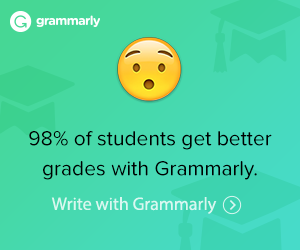 **The discount will be taken off the in the shopping cart after you apply the homeschool coupon code. 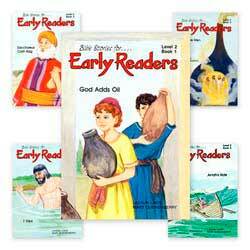 Add in once to get the discount on all Alpha Omega Curriculum including Horizons, LIFEPACs, Switched-On Schoolhouse, and Bible Stories for Early Readers. Can not be combined with any other coupon codes and excludes items marked clearance.